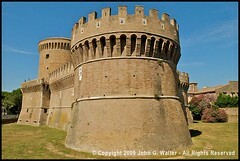 Because Rome is so rich in must-see tourist sights, many visitors neglect the surrounding area. One or two major guidebooks don't even give Lazio a chapter to itself, concentrating solely on Rome. It can't be denied that Rome does have a lot to offer every tourist. But for visitors who are staying more than a few days or returning visitors or for those who have simply had enough of the city, there are wonderful places easily reachable by car or public transport for a day or half a day trip. Day trips from Rome make a refreshing break from the chaos, noise and pollution of the city. They are also refreshingly cheap, since trains in Italy are an economical means of transport, and the blue Cotral buses which serve the area are frequent and cheap also. Ostia Antica: A 40-minute train ride from Piramide station or a pleasant drive along Via del Mare, is Ostia Antica – Imperial Rome’s main port from the second to ninth centuries AD. It was founded in the seventh century BC, by King Ancus Marcius, and lay abandoned until excavations in the 19th century. The shoreline has now withdrawn three kilometres (two miles) away to the present Lido di Ostia and, at first glance, all that can be seen is a network of thoroughfares with the odd upstanding column. However, a few hours spent in this quiet spot and the imagination will conjure up the former thriving town and the day-to-day lives of its inhabitants. The main artery, the Decumanus Maximus, leads to an amphitheatre with fantastic acoustics, which is perfect for a peaceful picnic. Mosaics at the Forum of the Corporations depict the produce sold or trade practised, while the bar, Thermopiliu, with its wide marble counter and lively fresco, evokes leisure time. Temples to a host of deities summon up the religious life and the homes of Ostia’s inhabitants reveal mosaic interiors, while communal latrines are testament to more mundane activities. The museum displays coins, glassware and statues. The site (tel: (06) 5635 2830) is open daily 0830-1930 (April-October) and daily 0900-1700 (November-March). Admission costs €4. Tivoli: A 30km (20 miles) drive east of Rome (along the A24) lies the hilltop town of Tivoli. Alternatively, travellers can take a COTRAL bus from Ponte Mammolo metro stop or a train from Termini or Tiburtina stations (direction Avezzano). Both stop at Tivoli. Conquered by the Romans in 338BC, the town became the prized spot upon which to build luxurious villas and homes for wealthy families. The Villa d’Este (tel: (0774) 312 070) is one such folly, built in 1550, according to the whim of art patron Cardinal Ippolito d’Este (son of Lucrezia Borgia). The state apartment is decorated with the swirling frescoes and paintings of Correggio, Da Volterra and Perrin del Vaga, while outside are the vast Renaissance gardens. Their fountains can only be described as kitsch – the Owl Fountain – designed to echo the owl’s hoots – and Fontana dell’Organo Idraulico, which imitated the organ’s burblings. As much, if not more, imagination went into the construction of the Villa Adriana or Hadrian’s Villa (tel: (0774) 382 733 or (06) 3996 7900, information and bookings), which has been included on the UNESCO list of World Heritage Sites. Enough of the Canopus fountain – with its sturdy columns and statues overlooking a central pool – remains to evoke the peace of this domain and country retreat for Rome’s great military campaigner. It is thought that his favourite spot was the tiny island, cut off completely from the surrounding man-made pool (Teatro Marittimo) by an ingenious retractable bridge. The standard opening hours for both Villa d’Este and Villa Adriana are 0900-1930 (ticket office closes at 1800). Admission to each site costs €6.50. If you're feeling more ambitious, you can easily journey further afield. Swift train services run into Tuscany, Umbria and Campania, and your options include Florence, Naples, Orvieto, Spoleto, Siena.... WorldEscape offer apartments in Florence. or if you are fortunate enough to have a car, you'll be able to see much more of Lazio at your own pace. However, this site concentrates on places accessible by public transport. You may miss out on some of the more remote sights, but all the destinations featured here contain enough to occupy you for an enjoyable day out.